Secondly, there are some exciting things happening in our little community right now that I want to mention. Meghann's training for a marathon! Not only is she training, she's raising money for The Leukemia and Lymphoma Society. Please check out her blog to keep up with her progress and to donate if you can! Also, she will be hosting a blogger bake sale the week of February 9th (I'll be selling some goods!) so be sure to check in and bid on some tasty treats to support a great cause! I don't plan to take pictures of every little thing because I work 10 feet away from my boss and I'm not willing to tell him about the blog yet. I try to take care of all photography in the morning and after work because I like consistency and I like the backdrop my table provides. :) But I do plan on at least telling you about all eats and keeping a running calorie count on my posts. I'll try to keep it simple and un-annoying...you might not even notice it. And, for the record, I haven't been keeping things from the blog purposefully, I just sometimes forget to mention something. Its never big...a dove chocolate here, handful of Kashi there...but as we all know, the small things add up. :) I don't plan to calorie count forever, but I do find that it helps me to gain perspective on what I am consuming. 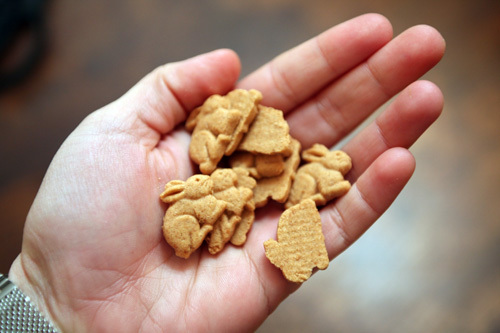 Now, on to today's eats! I tried something new with my oats this morning, something I've seen Kath and many others do...I added wheatberries to my oatmeal. And...I LOVED it!!! Breakfast: banana, PB, wheatberry + dried apricot oats. Seriously, this may beat my banana, PB, fig + flax oats...or at least equal it. 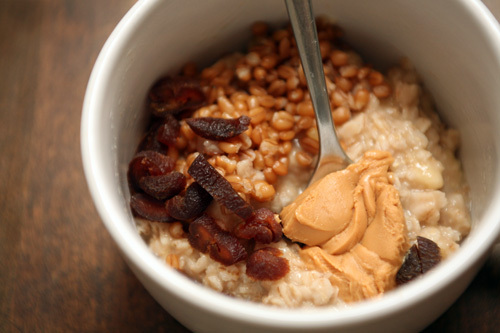 The wheatberries added such a wonderful chewy crunch! 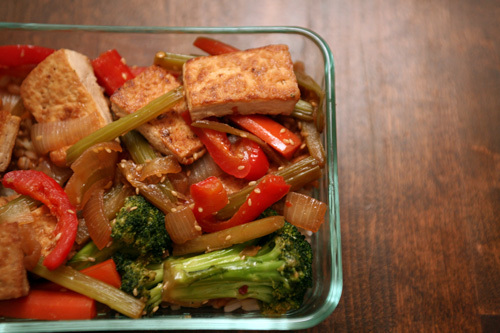 Lunch: leftover veggie tofu stir fry on 1/2 cup jasmine rice and 1/2 cup wheatberries. 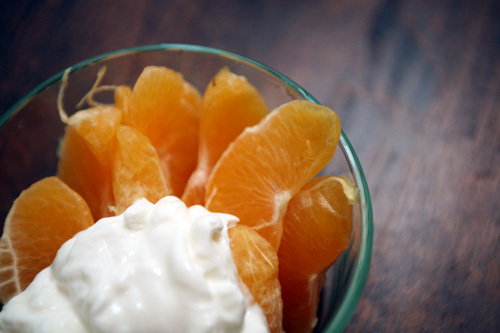 Afternoon Snack: 1/2 cup plain Fage 0% and one tangelo. 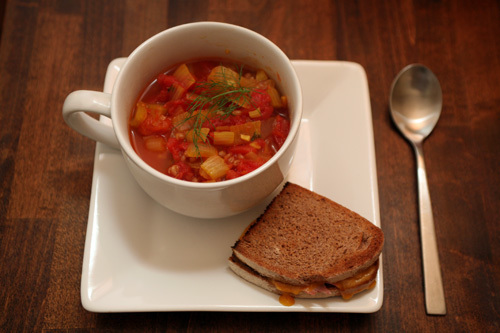 Dinner: saffron tomato fennel soup [recipe] and "grilled cheese". 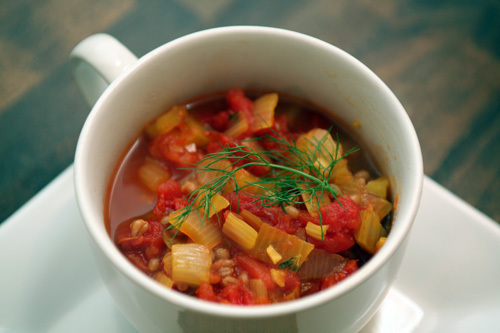 This is one of my favorite soups, we make it several times a year. I added wheatberries this time and substituted thyme for basil because its what I had. I just realized that I had wheatberries with every meal today...versatile little things, aren't they?!? 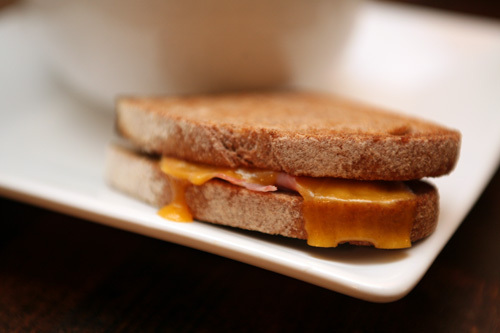 My substitute for the classic gilled cheese I normally enjoy with tomato soup was a broiled ham + cheddar sandwich on whole wheat sourdough bread. 1 slice bread, 1oz cheddar, 1/2oz sliced ham. Exercise: I went for a run!!! FINALLY! It felt great to be back out on the road, stretching out my legs. I had my new inserts in my shoes and I have to say, they hurt my feet a little! I'm hoping its just because my feet aren't used to them yet. I'm going to give it a few more runs and see how they feel. My toes have been all weird and tingly tonight too. They felt like they were asleep when I finished my run, and now they are red, a little puffy, and hurt to the touch. Strange! I've never had that happen before, and I'm hoping it will pass quickly! So other than my weird feet issues my 3-mile run felt great. I'm still hoping to train for the race, and am planning on getting a 5-6 mile long run in this weekend. I'll re-evaluate my training schedule after that. I try to net between 1200 and 1300 calories/day when I am striving to lose weight, so I was way over tonight. This is what I love about calorie counting, if you had asked me before I counted, I would have told you that I did pretty well and was close to 1200 net calories. Wrong! Counting really helps me to keep perspective, and it makes me want to workout more so that I don't have to be as strict with my eats! Tomorrow my goals are to lower my breakfast and lunch cals and reduce my "extras". I also want to get up for some yoga in the morning and make sure to get a run in tomorrow evening. Do any of you count calories? What service do you use? I use myfooddiary.com, but you have to pay for it and I'm hoping to find a free service. I've got some work to do, then I'm planning on a hot bath with my book. :) G'night!